When Jesus had come near to the city of Bethpage and Bethany and was at the Mount of Olives, Jesus sent His disciples into the city. The disciples did as Jesus commanded them. They entered the village and found a donkey along with its colt which had never been sat before. The disciples loosen and untied the donkey and the colt. The disciples replied, “The Lord needs it.” So the people let them take the donkey and the colt to Jesus. After the disciples had brought the donkey and its colt, they lay their clothes on the donkey so that Jesus could sit on it. 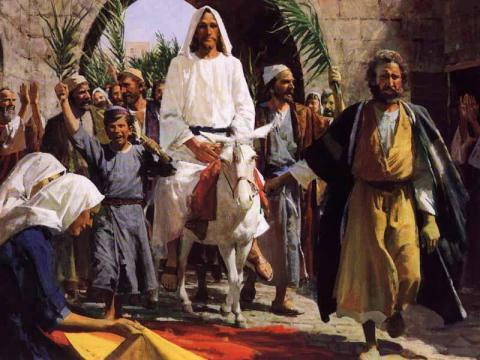 Others had cut down leafy branches and lay them down on the road for Jesus. Jesus went into the temple and looked around. Then he retreated to Bethany with His twelve disciples.